As we made our way back to Avalon I, we came across Fletch and Nick wading in the shallows. Their guide, Jimmi, was fishing with Nick and Fletch was maybe a hundred or so feet in front of them fishing by himself. It is a thing of beauty to watch Fletch fish, particularly when he is out of the boat and standing in knee-deep water throwing a line sixty or seventy feet. There is an ease in his body and a natural rhythm to his movements that you see in any natural athlete no matter the sport. When he is standing on the nose of a skiff fly-fishing he can sometimes look awkward and stiff, but when he is by himself in the water he is as natural a fisherman as a white egret. Sometimes when I am with him and I am also standing in the shallows fishing, maybe only fifty feet away, I will stop and watch him the way one would stop and watch a great basketball player if they were shooting hoops by themselves on a school-yard lot. When Jimmi saw us slowly passing by he got on the skiff’s 2-way and had a garbled conversation with Keko. Even if you know Spanish well it is almost impossible to tell what the guides say to each other over the 2-way radios. Maybe they speak in code or perhaps they just have their own separate language, like twin babies. I do not know. I just know no one else can understand them. Fletch and Nick with the lobster Jimmi caught. Photo by David Lansing. After the conversation, Jimmi went running back down the beach, away from us, and Fletch and Nick waded over to our boat. We gave them a hand and they climbed in. Nick said that while he and Jimmi were fishing together a large lobster had scooted by next to their feet and Jimmi had reached down and grabbed it and then stashed it somewhere in the shallows weighted down by some stones. That is why he’d gone running back down the beach. To retrieve the lobster. We told them how Greg and I had each caught a single bonefish, how they were good size, as good as you could wish for on your first day in the Jardines, and Nick, who had never been saltwater fly-fishing before, told us how he’d hooked a couple of bonefish himself but hadn’t been able to land them. Still, he didn’t seem the least bit upset about it. I think he was happy just to be here fishing with us and to have seen the fish and to have been able to properly get several of them to take the fly. We had only been in the Jardines for a few hours and we had the entire week ahead of us so it was not important whether you caught anything or not today. That would come. For now it was enough just to be out on the water with the fish running and the sun slowly setting off on the horizon. 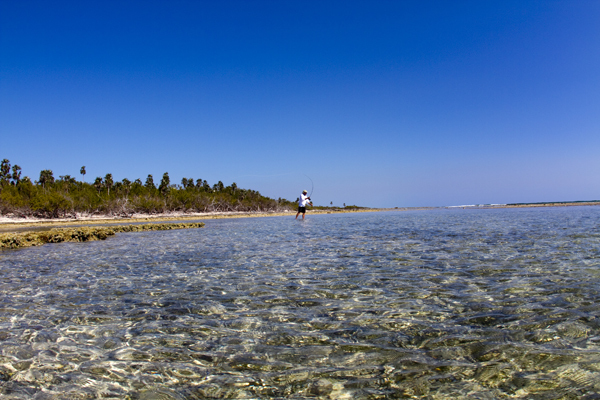 Fletch had actually caught two bonefish fishing by himself. He’d also seen many tarpon and had hooked three of them but, because of nerves, had held the rod too high and not put the end down on the water as you have to do when the tarpon jump and had lost them. Like Nick, he wasn’t upset about losing the fish either. It was an extraordinary afternoon, the weather as good as one could hope for with almost no wind and there was no need to worry about losing a few fish. It was not important. Once Fletch and Nick were in the boat with their rods, we pushed off from the shallows and motored along the beach until we saw Jimmi. 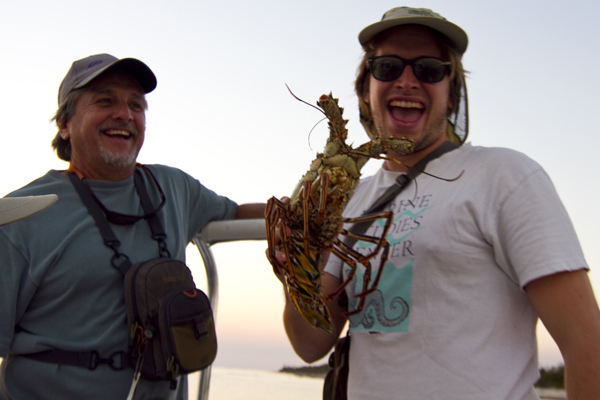 He waded out to us and handed the lobster he’d caught to Nick. It was a good-sized lobster, missing its antennas, perhaps when Jimmi had caught it or perhaps from the way he’d trapped it afterwards. We motored back to Jimmi’s skiff and Fletch and Nick and Jimmi got out and then, just as the sun was disappearing into the ocean, we all headed back to Avalon I.
Greg brings in a bonefish just before sunset. Photo by David Lansing. By the time we anchored Saturday afternoon it was close to four o’clock. That doesn’t leave much time for fishing, but there is just something about that first day on the water—the crispness of the air, the golden color of the light, the song of waves slapping the boat—that makes you want to get out there and toss a fly even if you don’t catch anything. I’d asked Keko, the Saltwater Fly-fishing Buddha God, to rig my gear for bonefishing while we were still traveling out to the Jardines de la Reina. He’d tested the line and put on a new leader and tightened the drag. He asked for my box of flies and I gave them to him, silently remonstrating myself for not getting new flies for this trip or at least sharpening the hooks of my old ones. There is nothing worse than hooking into a fish and then loosing them before they get to the boat because the hook is dull or the line frayed. Greg is even more conscientious about his equipment than I am and he was also ready to go the minute Eric, the Avalon’s captain, turned off the engines, so the two of us partnered up and gathered our bone rods and a single tarpon rod along with our fly boxes and tack gear and climbed into Keko’s Dolphin skiff, waving to the others on the stern of the boat as they scrambled looking for rods and hats and cameras. I like being the first away that first afternoon. 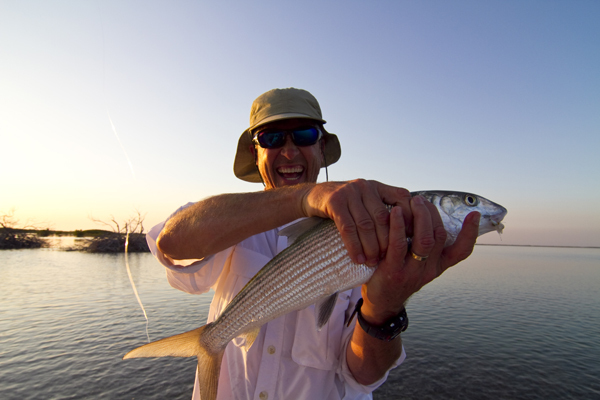 There is no advantage to it; fly-fishing is about skill but it is also about luck and it was quite possible that we’d be the first to toss a fly at a bonefish and the last to catch one. You could never tell. Still, just the thought of being the first ones on the water and knowing that, even if only for 15 or 20 minutes, we had all of the Jardines to ourselves was invigorating. I have been here before. Many times. Still, it is always as if it were for the first time. You can always remember the feel of flying through the shallow water of the mangroves in the skiff and the smell of saltwater spray and the beauty of watching a blue heron rise up out of the shallows and gracefully fly next to the skiff for three or four minutes before veering back into the shelter of the mangroves, but those are just memories. It’s like remembering Christmas three years ago. You can almost certainly do it, but it is not the same as when you are there and you are living it. And that’s the way Greg and I felt. We were there in the moment. Neither one of us spoke. I was sitting towards the rear of the skiff next to Keko and Greg was sitting up front in the jump seat and he might turn his head back towards me as an osprey dove into the water, just to make sure I’d seen it, and I would nod and smile and he would smile back and there was no need for words about what we had just seen or how we felt about it. While the first afternoon of fishing is always the most lovely, it is not always the most successful. There is the fear when Keko spots the first school of approaching bonefish and tells you to cast “eleven o’clock, fifteen meters…more right, more right, my friend” that you will only get the line out ten meters or you will throw the fly on top of the bonefish, spooking them, or worse yet, you will have forgotten how to bring the line back behind your head smoothly and easily, waiting for the line to load, and instead you will rush it, lofting the fly up into the air where it will puddle and drop straight down like a snowflake just feet in front of you. This is what you fear and you fear it for good reason because no matter how good a fly-fisherman you are and how easily you made this same cast the last time you were in the Jardines, that was then and this is now and your muscle memory seems to have forgotten everything it learned before and it betrays you in ways you could not imagine. And then it is up to Keko to be patient and calm you down and help you get back in to your rhythm. And it does get better. But it takes awhile. And meanwhile you’ve scared away the largest school of bonefish you’ve ever seen in your life and not come close to casting properly at several others that swam by oblivious of your attempts to present them with a suitable fly and now the sun is just holding up over the horizon waiting for you to do something, to catch that first bone, so all of you can call it a day. And then it happened. Quickly, unexpectedly. 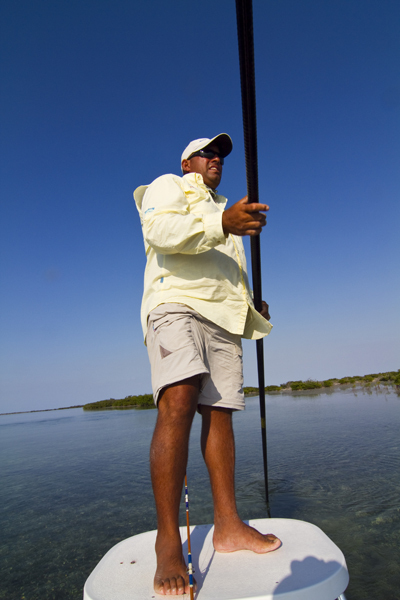 Keko spotted a bonefish 15 or 20 meters to the left of the boat, towards shore, and Greg had to cast as far as he possibly could, into the wind that was blowing lightly off from the islands, and he stripped the line and there it was, the hit, and Keko was yelling, “Bonefish! Big one!” and the fish ran and Greg took his hand off the reel and let the line go out, badly afraid that the fish would wrap the line around the coral or just snap it off, but reminding himself to keep his pole up, pointed at the fish at it ran, turning him around when he was taking out too much line, quickly reeling in when the bone tried to catch his breath, letting it run again, far, far, farther, until he was sure that he’d run out of line, and just then the bone stopping and Greg able to reel in as fast as he could, the tip of the rod high, and then it was at the boat and Keko was lifting it up and into Greg’s hand. Three years ago when we came to Cuba, we asked our guides what we could bring them if we came back the following year. Their answer: Baseball equipment. All the guides had kids who played baseball, but, they told us, it was very, very hard to buy the equipment in the little towns where they lived. I mean, they couldn’t just go down to the local sporting goods store and get their kid a mitt or a bat because, well, there were no sporting goods stores. So the next year, Chris Fletcher bought a bunch of baseball equipment and we split it up amongst three of us and hauled it over there in duffel bags and handed it out at the end of the trip. That was great. But when we saw the looks on the faces of the other staff members of the boat who also had kids and hadn’t gotten a Yankee cap or a brand-new baseball, well, we kind of felt bad about it. This year, Mr. Fletcher, who is surely one of the most generous and caring individuals I’ve ever met in my life, again organized Operation: Cuban Béisbol. A few weeks ago he called me up and asked if I’d mind taking some of the equipment over and so I stopped by his house and looked at all the new gear that he had spread across his pool table. There were a dozen gloves, two dozen baseball caps (evenly split between the Yankees and Boston), half a dozen metal bats, and three batting helmets. It was amazing. I managed to jam two of the bats into my plastic fishing rod carrier and filled a duffel bag with a box of baseballs, a couple of gloves, and half of the hats. Fletch filled another duffel with equipment and then recruited another member of our group, Greg Geiser, to carry the rest. This time we organized the give-away much differently. Instead of waiting until the end of the trip and handing stuff out to each guide, we called everybody up to the second deck and just took all of the equipment out of our duffels and spread it across the teak table. It was fun for us, too. The guides were very appreciative. But so was the rest of the staff, including the only woman on the boat, Suliet, who has a 3-year-old who is just starting to learn to play catch with his dad. One of the boxes of balls Fletch brought were the soft balls for smaller kids and Suliet couldn’t wait to give him one and a Yankees cap. After we’d distributed all of the gear on the table, the guides scooped it up and took it back to the crew quarters and we could see them, through the pass window, excitedly looking everything over and swapping equipment with each other, trying to decide who would get a glove or a batting helmet or a bat. The best part was that there are nine crew members so everyone got both a Yankee and a Boston cap and everyone also got a couple of baseballs. I’m looking forward to getting those photos. Well, I told you Greg would come up with another idea on how to find Nancy Jimenez and he did. On the long early morning bus ride to the port down of Jucaro, we were talking with one of the Cuban organizers of our fishing adventure, Antonio, and Greg was telling him all about our futile search for Diego’s friend and wondering what else he could do to find this woman. So how do I find the right people? Greg asked. How many spies did he end up sending to the States? we asked him. Antonio shrugged. “Dozens,” he said. Anyway, Antonio’s dad is retired now but Antonio said he still had all of his connections and knew how to find people in Cuba. With the information Greg had already given him—her name and former address—he thought his dad could find Nancy Jimenez is just a few days. So Greg gave Antonio something like a hundred dollars to give to his dad as a down-payment on doing a little private investigating for him. We’ll see what happens. Well, Antonio turned out to be right. The Avalon I was a major upgrade. Not only was it newer but it was also much larger. Each of us was given our own stateroom with our own bathroom and shower and there was a wonderful general area on the second deck with wicker chairs and a large teak table where we would take our meals and a bar in the corner where we could mix up our mojitos at the end of the day. We drew straws for the rooms since some had queen beds and others were singles and I got one of the smaller rooms but it didn’t matter. It still seemed luxurious compared to quarters on the Halcon.